It’s that time of year again! The time for donning caps and gowns if you are a senior, or if not, at least setting aside those textbooks and pencils for a nice …bonfire. A beanie bonfire, to be exact. A large freshman beanie replica burns in the bonfire during the Moving Up Ceremony, 1926. University Photograph Collection box 1702. From 1916 to 1934, freshmen at Iowa State College were required to wear “freshmen beanies” or “prep caps” on campus. After suffering through a year of harassment that the caps brought upon them, freshman were quite happy to ditch them at the end of the year. Beginning in 1923, students held a mock-graduation, the Moving Up Ceremony, during VEISHEA celebrations, at which time seniors became alumni and everyone else moved up a grade. The freshmen burned their beanies in a roaring bonfire. By 1934, the caps were no longer worn and the moving up ceremony faded due to lack of interest. We’re lucky to have a surviving beanie in the University Archives at ISU. It belonged to Robert W. Breckenridge. Robert saved his freshman beanie from 1918 instead of burning it, and it now resides in the archives. Freshman beanie belonging to Robert W. Breckenridge, from 1918. From University Archives Artifact Collection, 2002-189. It even has it’s own fancy box and hat stand! More images of the Moving Up Ceremony can be found in the Student Life album on our Flickr page. **Please note: this article preceded Caitlyn Jenner’s announcement of her name change and gender expression. Posts published after her announcement, will use her correct pronouns and name. It’s April 1, so you may think this is a prank, but nope: the famous (notorious?) 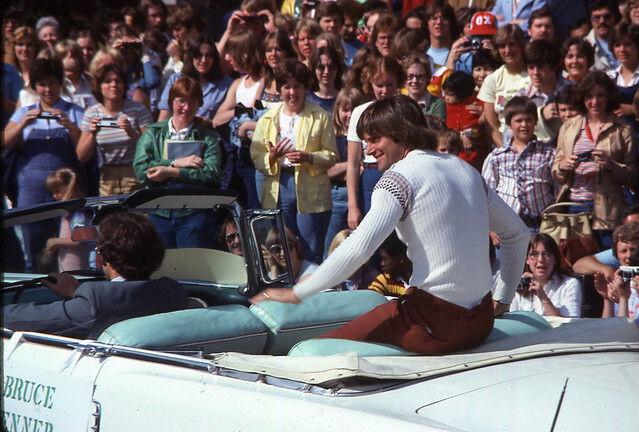 Kardashian stepdad appeared in the VEISHEA parade in 1977. Education float from the 1922 Parade (addditional VEISHEA parade images can be found online, along with other VEISHEA images). Next week marks the beginning of VEISHEA, Iowa State’s spring celebration and the largest student-run celebration in the country. In addition to all of the 2012 events going on throughout the week, VEISHEA will also be celebrating its 90th anniversary! VEISHEA was first celebrated in May 1922, a combination of Iowa State’s various spring celebrations which had previously occurred separately each spring: St. Patrick’s Day (Engineers), Ag Carnival (Agriculture), HEC Day (Home Economics Club), and May Day (started by Women’s Athletic Association). “Primary Purpose of Exposition: To eliminate the break in college work caused by five divisional celebrations, on five week-ends of two terms. 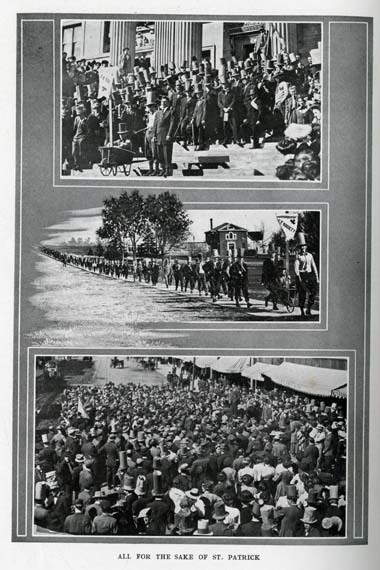 One could easily say that these purposes from that first VEISHEA ninety years ago are clearly not outdated ninety years later, but are still an almost unchanged, central part of our VEISHEA celebrations as this year’s 2012 theme illustrates: “VEISHEA, A Timeless Tradition”. In fact, the name of VEISHEA itself reflects the emphasis on unity Iowa State expressed, and continues to express, through its VEISHEA celebrations. VEISHEA is an acronym for the five divisions which in 1922 made up Iowa State: Veterinary, Engineering, Industrial Science, Home Economics, and Agriculture. 1922 Physics float, complete with telescope, Benjamin Franklin, and Galileo. In addition to the photographs and program, we have also recently made the programs for the 1922 May Fete and the 1922 Nite Show (which later became Stars Over VEISHEA) available online through Scribd. Wondering how you can learn more about VEISHEA celebrations and its timeless traditions? Swing by the University Archives to look through our VEISHEA Records (the records are organized by decade, and the finding aids describing the contents can be found listed here under RS 22/12). In addition, we have many of our VEISHEA photographs available online. A selection of VEISHEA film footage can be found on our YouTube channel under Iowa State University Films. You can also page through The Bomb, Iowa State’s yearbook, to see a glimpse of each year’s VEISHEA. The Bomb available in the General Collection, call number LD2548 Io9b, or in the Special Collections’ Reading Room. We also have an online exhibit about the history of VEISHEA. The exhibit contains a bibliography listing other resources related to VEISHEA available in our department. We also have several other blog posts related to VEISHEA: pre-VEISHEA celebrations, St. Patrick’s Day (engineers), and Stars Over VEISHEA. Check out all of this year’s VEISHEA events and activities here! VEISHEA is fast approaching – in fact, the fun and excitement of the largest student-run celebration in the country will begin next week on April 11. The Special Collections Department has VEISHEA records documenting former celebrations, in addition to a variety of other resources. For more information on VEISHEA records you can find here in our department on VEISHEA’s history, visit last year’s VEISHEA blog post. However, if you are looking for the personal perspective of Iowa State students during VEISHEA, a good place to look are the papers donated by our alumni, and a listing of these collections (however – please note – not all of these necessarily mention VEISHEA!) can be found here under RS 21/7: Alumni and Former Students. The Special Collections Department recently took in a new collection documenting student life here at Iowa State in the middle of the twentieth century, and the letters in this collection mention VEISHEA. The Donald Elwood Larew Papers (RS 21/7/232) contain letters, theater programs, and Iowa State University memorabilia. A graduate of Iowa State University, Larew received his B.S. (1963) in applied art with an emphasis in interior design. For more on Larew’s career in theater design, see the biographical note in the collection’s finding aid. Pictured above is the 1963 Stars Over VEISHEA production, The Music Man, performed during Larew’s senior year at Iowa State. Larew helped design the set for this, along with other Iowa State theater productions. The majority of the collection contains letters Larew wrote home to his parents, which includes descriptions of his involvement with the fraternity Delta Upsilon and as a cast member and set designer for a number of campus theatrical productions. 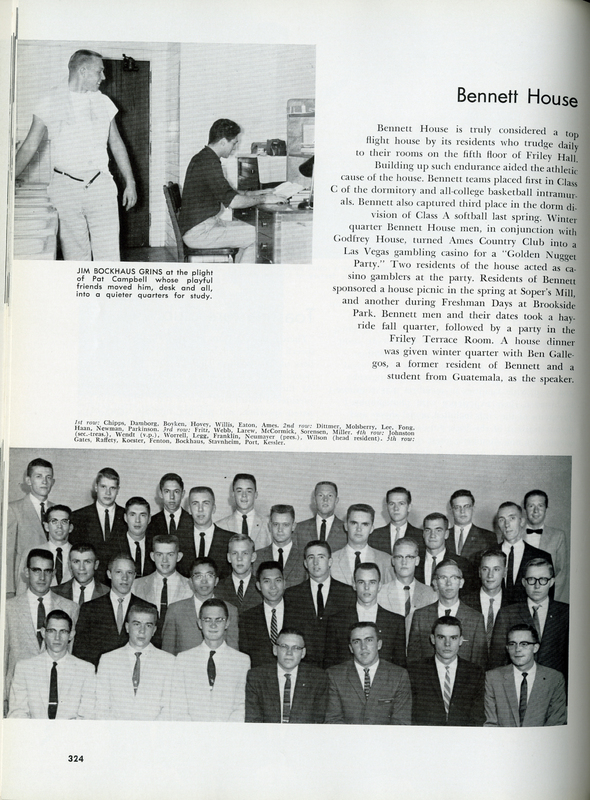 Page 324 from the 1959 Bomb (ISU yearbook). Before joining the fraternity Delta Upsilon, Larew was a member of the Bennett House in Friley Hall his freshman year. The description found here in the Bomb helps one figure out certain references Larew makes in his letters to the activities described above. Click on the image above to read the description. Larew frequently mentions the theater in his letters home. He mentions plays he appeared in and the ones he helped design sets for. While at Iowa State, Larew was involved with both the Iowa State Players and Stars Over VEISHEA. In fact, the first Stars Over VEISHEA production with which Larew was involved was Shakespeare’s Taming of the Shrew (this year’s Kiss Me Kate is in part based on this Shakespeare play). From pages 168-169 of the 1959 Bomb (ISU yearbook). 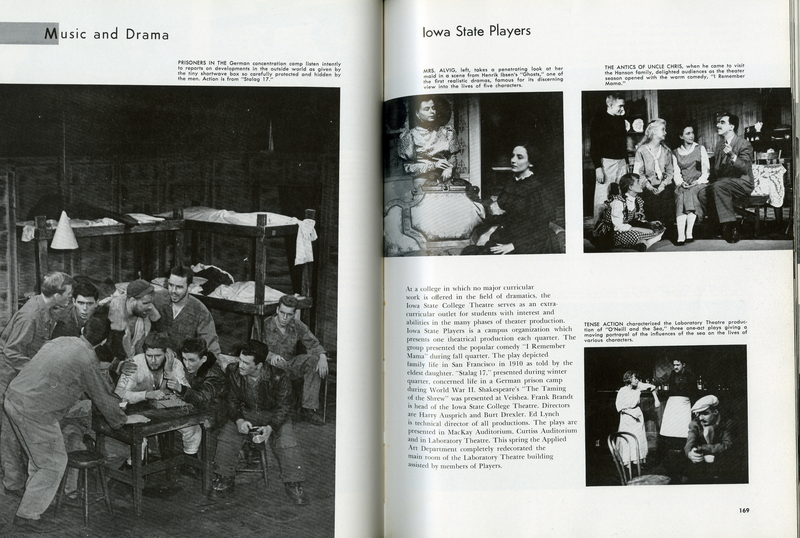 In his letters, Larew mentions being a cast member of the Iowa State Player’s “Stalag 17” production. Click on the image to read about the Iowa State Players. To find out more about Donald Elwood Larew and the papers he donated to Iowa State, please take a look at the collection’s finding aid. 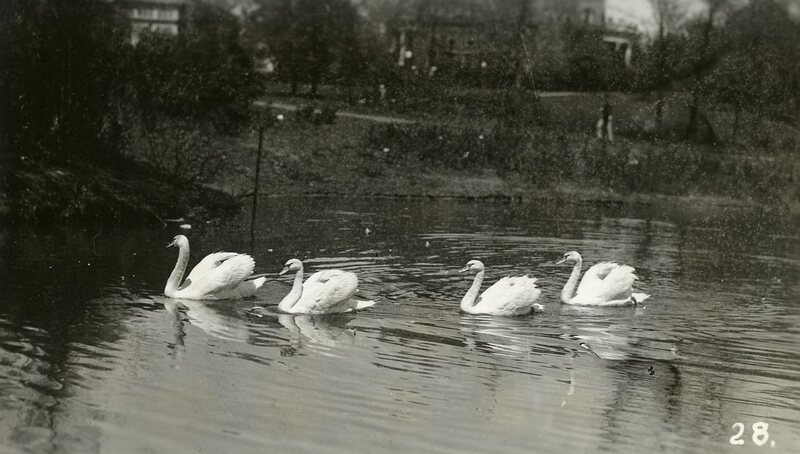 Parades, carnivals, cherry pies, performances, and open houses are examples of many VEISHEA traditions which at one point in time had their first appearance on the Iowa State campus, eventually becoming traditions of today’s celebrations. In honor of this year’s VEISHEA theme, “Today’s Vision, Tomorrow’s Tradition,” below are just a few “visions” which eventually became VEISHEA traditions and have continued to the present day. This post is just going to name a few of the VEISHEA traditions which began before the first VEISHEA in 1922 – and which continue today. Before 1922, many Iowa State divisions celebrated separate spring festivals. Since these numerous festivities caused much disruption to the students’ studies in the spring, it was decided to combine the separate celebrations into one. Much of the information we have here in the University Archives on these early spring celebrations come from various publications, such as the yearbook (Bomb), division newsletters, and the Alumnus. Many of the articles and references from these early publications have been photocopied and put together in what could be called a subject file in the University Archives. For those of you not familiar with Iowa State and who are wondering what this VEISHEA is, VEISHEA is Iowa State’s week-long, student-run spring celebration. To find out more, the VEISHEA website can be found here. Carnival: The Division of Agriculture’s celebration was the Ag Carnival, first celebrated in May 1912. The agriculture students put on a carnival in the tradition of the country fair. Festivities often included a parade, exhibits, concessions, and a dance. Concession stand for the 1914 Ag Carnival. Student food stands can still be found on campus during VEISHEA. 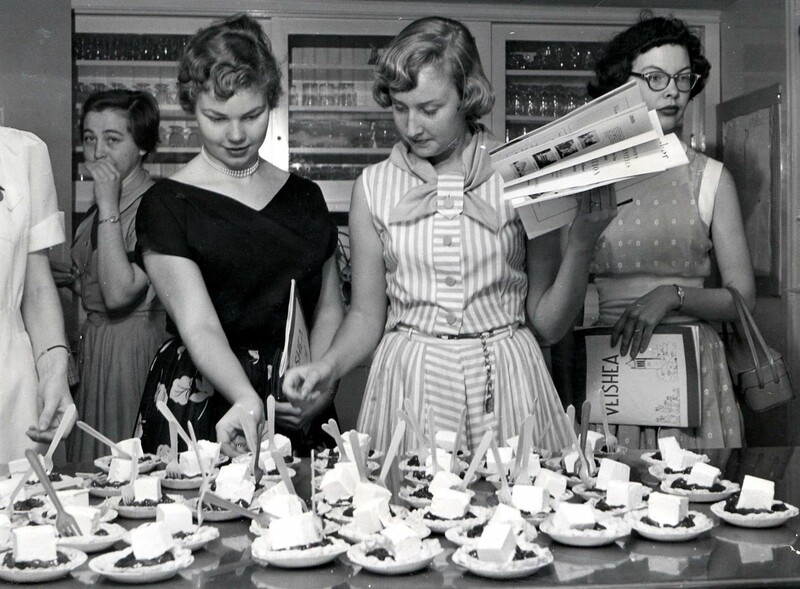 Cherry pies: Now a much-loved VEISHEA tradition, cherry pies were originally sold during Home Economics Day (celebrated in February) beginning in 1920. Cherry pies of the 1922 Home Economics Day. Parade: Several of the early divisional celebrations included a parade, including the engineer’s St. Patrick’s Day parade and the agricultural students’ Ag Carnival parade. For more on the engineer’s first St. Patrick’s day celebration, see an earlier post. Although not labeled as such, this 1910 image of the engineer’s St. Patrick’s Day celebration is probably their first parade one hundred years ago, on their way either to or from the “village” of Ames. Luckily the parade these days takes place in a much safer location! To find out more about VEISHEA and the early divisional celebrations…come visit us! We also have a web exhibit on VEISHEA, which includes a bibliography of resources here in Special Collections. In addition, a selection of photographs from our university photograph collection can be found in the library’s Digital Collections. There are also other images on our Flickr site, and films on YouTube. One hundred years ago today, the engineering students celebrated their first organized St. Patrick’s Day here at Iowa State College (now University). Why were the engineers celebrating St. Patrick’s Day? Not because ISU engineering students were all Irish, but because St. Patrick is the patron saint of engineers. In addition, as the Iowa Engineer (call number TA1 Io9) of April 1910 explains, the Civil Engineering Society had been concerned about the safety of the money in their coffers, so they decided to spend it on a St. Patrick’s Day celebration. The 1910 festivities included a parade which stopped at Central Hall on campus and in the “village” of Ames, a ball game, roller skating, and finally a banquet late in the evening. The engineers continued to celebrate their patron saint’s holiday on March 17 through 1921, when the separate spring festivals of Iowa State College’s Divisions were combined into VEISHEA in 1922. The information the University Archives has on the St. Patrick’s Day celebration mainly comes from written descriptions in publications such as the Iowa Engineer, the Alumnus, and Iowa State’s yearbook the Bomb. Photocopies of these articles have been pulled together into a subject file under RS 22/7/0/1. We also have photographs of the March 17 celebrations, as well as the traditions of the Division of Engineering’s St. Patrick’s Day celebrations which continued into VEISHEA, in our University Photograph Collection. In addition, the Special Collections Department has an online exhibit on VEISHEA, including a brief history, with images, of the St. Patrick’s Day celebration. Lá Fhéile Pádraig Sona Daoibh (Happy St. Patrick’s Day – to all)!